For those that may be wondering, the figma brand consists of highly detailed and articulated non-scale figures, which are manufactured by Max Factory. Most of them are anime related, but occasionally, figures from other media, such as video games and Hollywood movies, are released. Over the past ten years, there have been hundreds of different figma figures and in fact this year the 400th figma figure will be announced. I wonder which character that will be? Maybe a new version of the ever-popular Hatsune Miku? I really love the figma brand. It is without a doubt my favourite figure brand of all time. But it wasn’t the first articulated figure brand I ever got. No, the first ones I got were some Microman figures, which I got at the end of 2007. Microman is a brand of very small articulated figures produced by Takara Tomy. My intention was to use them as drawing aids, something which never really eventuated. But those Microman figures did get me interested in articulated figures in general. Up to that point, I had shunned them because of their “unsightly” joints. In January 2008, Revoltech launched it’s Fräulein series of articulated figures and I purchased the very first one: Rei Ayanami, in her iconic white plugsuit. This is a very nice looking figure, but truth be told, it has a couple of technical problems. The main one is that the joints tend to come loose very easily when you try to pose it. The other problem is that the stand it comes with is poorly designed. It is fixed and simply holds the figure up by its waist, which doesn’t allow for any dynamic posing whatsoever. Later Revoltech figures, such as the Queen’s Blade ones, have improved flexible stands, but they are not very strong and tend to sag over time. In fact, Queen’s Blade figures’ joints themselves also have this problem. But let’s get back to the figma series, because that’s what this article is about. As I mentioned above, the first Revoltech Fräulein figure came out in January 2008, the same month that the aforementioned limited edition Haruhi figma figure did. However, I did not become aware that the figma brand even existed until sometime in the middle of 2008, when I discovered the first standalone (i.e. 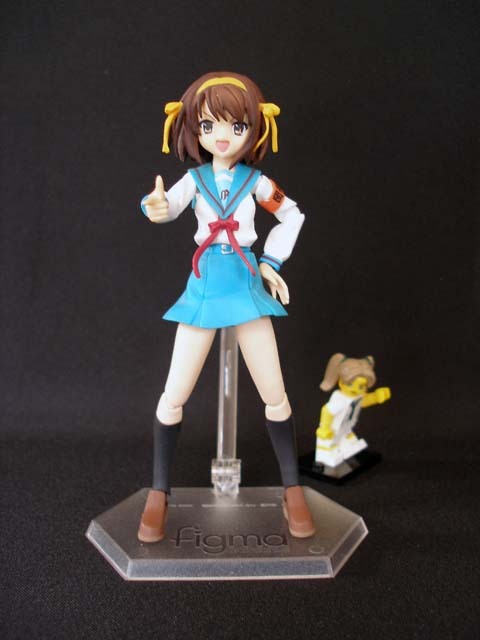 non-limited edition) Haruhi Suzumiya figma figure. I was absolutely amazed when I saw this figure; the attention to detail was fantastic, it was almost as if Haruhi had somehow leapt out of the screen and into the real world (albeit in a miniaturised form, of course). As you might be able to discern, figma figures do not use cloth; they are generally constructed from both ABS (soft) and PVC (hard) plastic, so creases and folds in clothing are all sculpted. The result is a much better representation of an anime character’s clothing than could be achieved by say, a doll with real clothing. As for the joints, they are well hidden when located on clothing, but even the “naked” joints are far from off-putting. And the stand that all figma figures come with is both highly flexible and incredibly sturdy: they seem like they will not sag a micrometre in a 100 years. The same goes for the figure’s joints; they hold their poses very well. The only real downside to the figma range is that they are non-scale. Of course, two figma figures from the same franchise will usually be in scale to one another, but those from different franchises may not be. 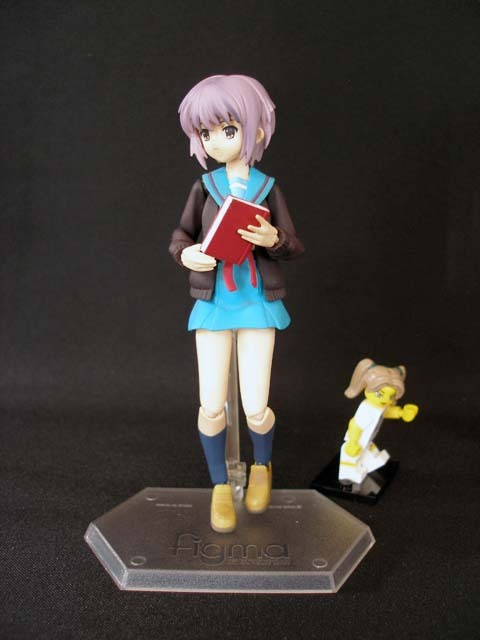 Yes, this is the very first standalone figma figure produced by Max Factory: Yuki Nagato, another character from The Melancholy of Haruhi Suzumiya. It was released on February 14, 2008 and I guess this date is the actual anniversary of the figma brand. 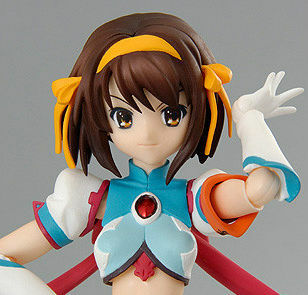 I had wondered why Yuki had a figma figure made of her before Haruhi, as Haruhi is the main heroine in The Melancholy of Haruhi Suzumiya, but I guess since the superhero version of Haruhi had just come out, Max Factory wanted something different for figma figure No. 001. Over the years, I have collected quite a number of figma figures. I’m not sure how many I have, but at a rough guess, I’d say about 30. Most of them are still in their boxes, which is why it’s a bit tricky to work out the exact number. Maybe I should take the time to catalogue them one day. And, you may ask, which figure is the one I think is the most interesting in my collection? The answer to this might be a little surprising. Yes, the one I consider the most interesting is not even a female figure. It is, of course, the very famous Indiana Jones. I was quite surprised that Max Factory went to the trouble of making this figma figure at all. But recently there have been more and more offbeat figures like this, such as Deadpool and the Overwatch characters. This is great, because it makes me think that even obscure characters I like might one day get “figmatized”. Speaking of getting “figmatized”, Good Smile Company (Max Factory’s partner company) is currently running a survey where you can nominate a character (or real-life person, or creature) that you’d like to see made into a figma figure. You can check out the survey here. It runs until February 20, so there’s still plenty of time to take part. I haven’t nominated anyone yet, as I’m still unsure what would be a worthwhile choice. I’ve thought about nominating Zelda, from The Legend of Zelda: Breath of the Wild, but I think there’s a strong chance that Max Factory will produce a figure of her eventually anyway. I’d really like to see a figma figure of Jill Valentine, from Resident Evil (AKA Biohazard), but I think that Max Factory would not see any merit in this, as Jill is kind of MIA at the moment. So probably the best thing is to choose a character that’s a bit left of centre but of the moment. Someone who fits this criteria quite nicely is Kizuna Ai, the thoroughly entertaining virtual YouTuber (who you can read more about here). She has the perfect dimensions for a figma figure. She’s also really popular at the moment and has even started releasing some of her own merchandise. Furthermore, she seems to have a very strong desire to make money, for some reason. So she’s a perfect fit, isn’t she? 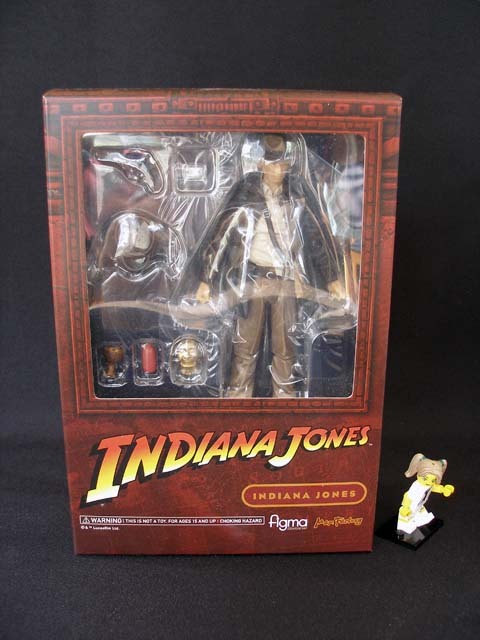 This entry was posted in 00s, 80s, Anime, Anniversary, Figures, Japanese Games, Light Novels, Western Films and tagged Figma, Haruhi Suzumiya, Indiana Jones, Max Factory, Yuki Nagato by maruserino. Bookmark the permalink.